It wasn’t the sales or the spiffy storefronts or even the delicious Mandarin restaurant that brought out WEtech Alliance for a tour of the new Devonshire Mall. General Manager Chris Savard was the beaming proud tour guide of the back-of-the-house innovations that make this mall – after a once-in-a-generation $70 million renovation – one of the most modern, eco friendly and accessible in Canada. General Manager Chris Savard shows off the Mall’s new waste sorting facility. One of the major advancements is the ACT Green policy, which stands for Always Consider Tomorrow, at the centre of which is the commitment by Devonshire Mall to divert at least 90 per cent of waste from the food court from going to the landfill. What first tips you off to the changes is the fact that you won’t find any garbage bins in the food court. 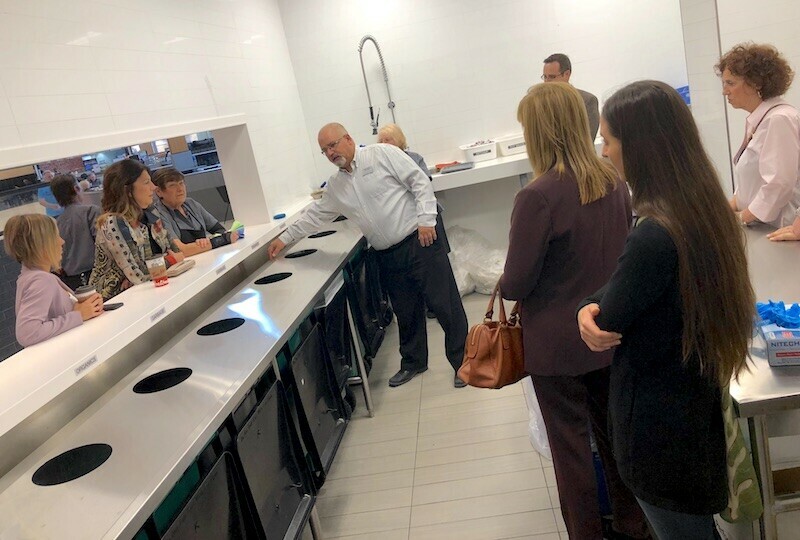 Patrons are asked to bring their trays to one of two Tray Stations where staff sort the organics from the plastics, paper, glass and metal – with the trays washed inside a giant machine that power scrubs 20 trays a minute. Savard pulls out multiple copies of printouts of the data collected so far which shows the Mall has already diverted 80,000 pounds of organics and exceeded its 90 per cent target in the last four months since it opened. But folks, that’s not all. The organic waste is converted onsite into compost with the help of three top-of-the-line 500 pound converters that can convert 500 pounds of organic waste into 125 pounds of compost in 15 hours. The Mall has already created 17,000 pounds of compost which it hands out to farmers in Essex County to help cultivate then next generation of vegetables. In the future, Savard hopes the organics might be converted into pellets and used as biofuel, perhaps to heat the greenhouses or cottages. Getting a look at the new Zero Waste Food Court, Rain Water Harvesting room & organics composters. Leaving the food-court our next stop was the rain harvesting room – where a giant two-thousand-gallon cistern collects water from the rooftop for use on the outdoor greenbelt on the mall campus. In addition to the big items, it’s the attention to little details which was impressive. Located at the entrance to the washrooms is a water filling station, which helps reduce the need for plastic bottles. Savard talks about the coming innovations, which include six electric vehicle charging stations that, when installed, will be able to fully charge a hybrid vehicle from zero to 100 in under four hours – enough time to catch a dinner-and-a-movie or take a lap around the 165 stores. The new Universal Washroom was designed in consultation with John McGiveny Children’s Centre. The entrance off Howard Avenue also contains both an e-bike charging station and a solar charging bench where you can power up your mobile device – they thought of everything. In addition to being an environmental leader, what stands out is the commitment to making Devonshire Mall barrier free for patrons with disabilities and encouraging healthy living among staff. 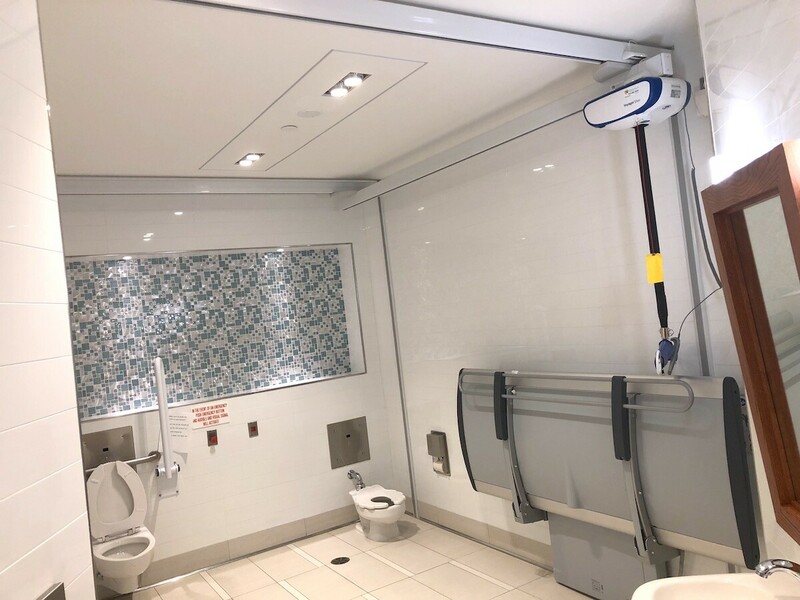 For example, Devonshire Mall consulted with and visited the John McGivney Children’s Centre on the design of the Universal Washroom – and has built perhaps the first and most advanced of its kind in a mall in Canada – which includes a change table and a lift system that helps folks with disabilities navigate the facilities. Devonshire Mall staff are not only encouraged to come to work by bike – by providing a bike storage room – but also showers are provided for staff that are fully accessible. After viewing the high tech Security Dispatch Centre – the tour came to a close, but not before our resident pun-master asked Savard the requisite question: what’s in store next, Chris? Savard talked about the plan to seek LEED Gold certification from the Canada Green Building Council, the potential for the vacated former Sears space, the brand new $650,000 investment in a new Christmas display, and the solid numbers that are trending up. Twenty-thousand people walk Devonshire Mall every day, which adds up to over 7 million visitors per year, and with the beautiful stores and amenities that number is going to rise. Savard boasts that Devonshire Mall is already one of the largest employers – with 2,500 workers both fulltime and part-time – and the largest taxpayer in the City. 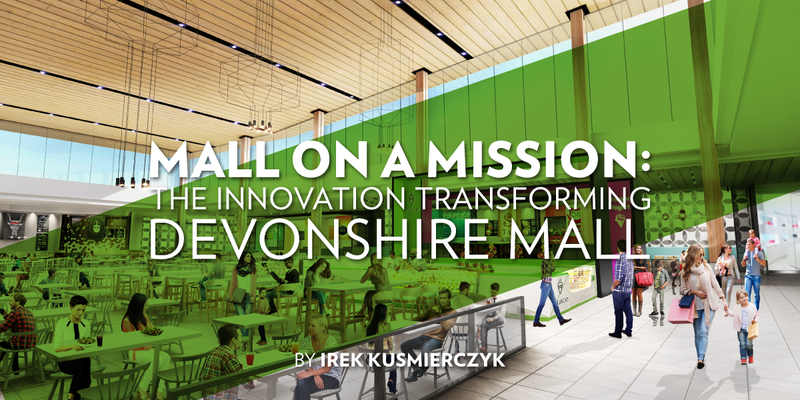 What became clear after the tour is that Devonshire Mall is striving to be more than a commercial space. It sees itself as a big community gathering place and equally important as a big community leader on a number of issues like innovation, eco-friendliness and accessibility. It’s a mission that aligns well with its ownership group – the Healthcare of Ontario Pension Plan (HOOPP). Certainly, it’s a great place to visit. But go and see for yourself – and pretty soon you’ll be beaming with pride too. Feel free to bring along the whole family. 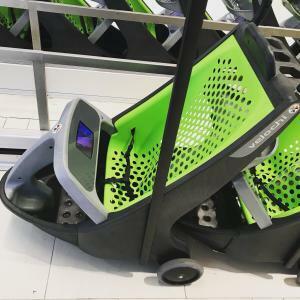 The kids will love the new strollers available for rental that feature a tablet loaded with apps and games. 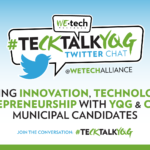 Irek Kusmierczyk is the Director of Partnerships at WEtech Alliance. Irek received his PhD in Political Science from Vanderbilt University, MSc in Government from the London School of Economics, and a Bachelor of Journalism from Carleton University. He is a City Councillor representing Ward 7 in Windsor and works on the Planning & Economic Development Standing Committee, Windsor Public Library, Tourism Windsor Essex & Pelee Island, and the Essex Regional Conservation Authority among others. His favourite flower is the tulip.